Please note: a trombone player would also be acceptable. SPOTTED BY: Several local reporters. 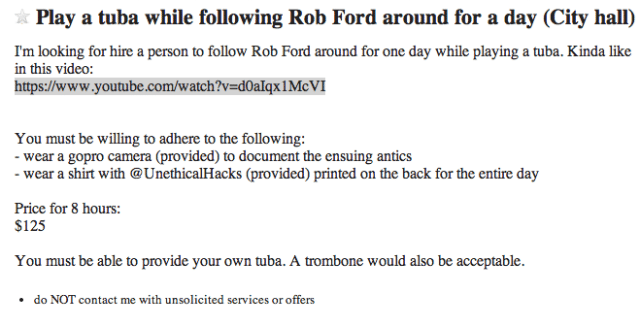 WHAT: A want ad that quite clearly states what it is it wants: a tuba (or perhaps trombone) player willing to follow the mayor around for a day (while playing the instrument, obviously) in exchange for $125. This does not appear to be part of an irreverent political action intended to draw attention to the circus-like atmosphere of the non-stop spectacle that is City Hall—instead, it looks as if it’s related to a website that provides somewhat sneaky and underhanded suggestions about how to avoid paying for things/fulfilling responsibilities (Example: “Take a picture with your phone anytime you see a traffic jam, a flat tire, or funeral procession. Use them later when you’re late for something and have no real excuse”)—which means that the website and the mayor could be said to have a certain amount in common, and that maybe someone should start following the site creators around with a tuba (or trombone), because it sounds as if they might also have it coming.